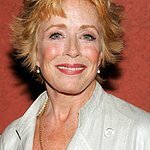 Holland Taylor is best known for roles such as Ruth Dunbar in Bosom Buddies, senator’s wife Margaret Powers on Norman Lear’s The Powers That Be, Judge Roberta Kittleson in The Practice and Evelyn Harper in Two and a Half Men. Among her charitable contributions, she has lent her time and talents, and given substantial financial support to numerous fundraisers such as Best In Drag Show to raise money for Aid for AIDS. Google trends for "Holland Taylor"
We don't have any videos related to Holland Taylor.